When you think of a gardener, who comes to mind? Do you think of a woman or a man? Most people would probably answer “a woman.” That may have been the thought, or even the truth, in years past, but it is a trend that is changing rather rapidly. According to the new garden trends report for 2014, young men between the ages of 18 and 34 will be spending about $100 more this year than the average gardener. What exactly they’ll be spending it on, I guess no one knows precisely, but I think there are a few good guesses as to why more guys are going out and getting their hands dirty, so to speak. Some of these reasons are known already, through interviews, questionnaires, etc. One is that grilling is growing in popularity, as people are learning that it’s a healthier choice, not to mention that cooking meals outside during nice, warm weather brings people together and allows for fun, relaxed entertainment opportunities. And with the vast selection of grills, grilling accessories, patio furniture, and decorative items available, it’s pretty easy to create an area that is attractive, comfortable, convenient, and fits whatever style you desire. This actually leads directly into another reason more men are pulling on their gardening gloves and joining the ladies outdoors. Beer. Ok, that’s not necessarily true. That’s a reason for some and part of the reason for others, and I suppose, not at all for many. However, what I’m getting at is the idea of growing your own foods and/or drinkable items. Sustainable gardening is getting a lot of press lately (as it should, in my opinion), and one aspect of that is brewing your own favorite chilled drinks. Yes, you can buy all the ingredients online, but wouldn’t it be better to be able to invite over your friends and family for a summer get-together and serve up some nice fermented drinks that you had not only made but had also GROWN? Hops, my friends, hops. Of course, it isn’t just beer people are growing plants for: planting grapes for wine is also gaining in popularity. The point is that the desire to grow your OWN plants in order to create the things you want to eat and drink is increasing. This is actually a topic I intend to explore a bit more in a blog for one of our sister companies, Park Seed. Every guy deserves a man cave, whether it’s inside or outside. And since these days, more men are getting involved in gardening and more people in general are spending their leisure time outside, simply enjoying the beauty of their natural surroundings, it only makes sense to build your man cave in your outdoor-living area. My husband is currently working on his own outdoor man cave, which I must say, I will enjoy just as much as he will. He’s building a deck on the side of our house that will be tailor-made for entertaining as well as simply relaxing. The entire deck will be great for our whole family, but one part is just for me and one is just for him. He’s building an arbor on one end that will allow me to indulge my plant obsession by growing a few evergreen climbers, bringing my garden right up next to me whenever I’m out there. I already have my plants picked out, too: Apple Blossom Clematis and Scentsation Honeysuckle. For himself, he’s planning a cooking area directly off the deck where he’ll have his grill and an outdoor pizza oven, something he has always wanted. And at the foot of the steps off the front of the deck, we’re going to put up a beautiful wrought-iron arbor with a gate, which will lead directly to his outdoor kitchen. Another place I’ll be able to grow a couple of vines! Once it’s built, all across the front and sides, I’m going to plant shrubs, a variety of perennials, and even a couple hardy tropical plants, such as cold-hardy banana trees. It’s truly going to be a space that’s fun, beautiful, and relaxing year-round—an outdoor man cave we can both be proud of. Eventually, I know he wants to add the ultimate man-cave addition: a nice big flat-screen TV, either next to the pool he’s planning to put in next year or perhaps even in the gazebo he wants to build off the corner of the deck. You can see that his vision is to create a space for absolute relaxation and entertainment! Who am I to deny him? But don’t think guys getting involved in gardening is completely about growing hops and building outdoor man caves. Nope. Lots of men simply enjoy picking out plants, creating unique displays, and watching their handiwork grow into something beautiful, which is exactly what women take pleasure in as well. There’s something truly exciting about wandering through a nursery or browsing an online gardening store and finding just the right plants for your garden. And let’s face it, spending time out in the sunshine and digging in the dirt is something most of us loved as children, and it’s just as much fun when you’re all grown up! Over the years, I’ve occasionally run into the idea that gardening is a “woman’s hobby,” and I imagine I’m not the only one to have met that way of thinking. Some people seem to think that if it involves flowers, it can’t be manly! Well, I’m here to tell you that that is completely false. And I’m SO glad that younger guys are taking no notice of such notions. Whether you’re growing a garden full of veggies, planting flowers beds and borders with a variety of colorful perennials, or filling a few pots with some edibles to place on your deck or patio, there’s nothing “sissy” about gardening. It can be hot, dirty, often muscle-ache-inducing work. And you know what, it’s worth every second! 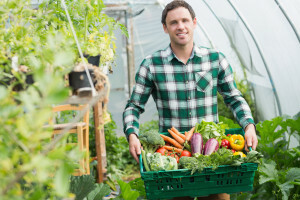 As I mentioned before, a lot more men (yes, and women, too) are growing hops and grapes to make their own wine and beer, but gardening is a also a great way for single guys to make sure they have healthy, nutritious foods for their own meals and married men to provide for their families. And ladies, if you’re wanting your men to spend more time with you and/or the kids, hand him some gardening gloves and a trowel. Creating something beautiful together and watching the rewards of your own hard work is a wonderful way to bring couples and families closer together. So guys, whether you want to eat it, drink it, watch it grow, or simply sit down and relax in it, get out there and get dirty. Remember, real men garden! Did you know that there are men’s gardening clubs (although, yes, most allow women as well)? If you’d like to find one near you, check out The Gardeners Of America/Men’s Garden Clubs of America site.